← Cancer Treatment — Unaffordable, less effective than advertised! 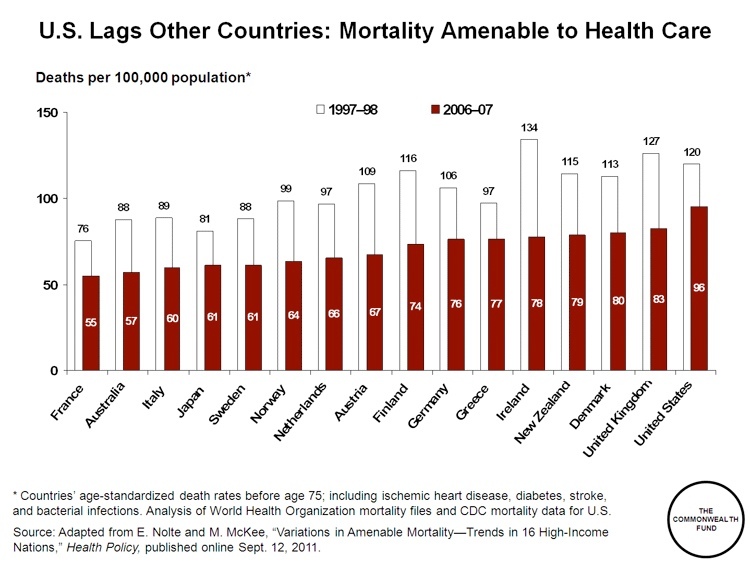 The United States placed last among 16 high-income, industrialized nations when it comes to deaths that could potentially have been prevented by timely access to effective health care, according to a Commonwealth Fund–supported study that appeared online in the journal Health Policy this week and will be available in print on October 25th as part of the November issue. According to the study, other nations lowered their preventable death rates an average of 31 percent between 1997–98 and 2006–07, while the U.S. rate declined by only 20 percent, from 120 to 96 per 100,000. At the end of the decade, the preventable mortality rate in the U.S. was almost twice that in France, which had the lowest rate—55 per 100,000. Another way to look at this is that we’re number one. Medicynical Note: U.S. Health Care leads the world in cost/capita, bankruptcies related to medical problems, drug costs, number of procedures done/capita, and now the number of people dying because they don’t have access to timely health care.